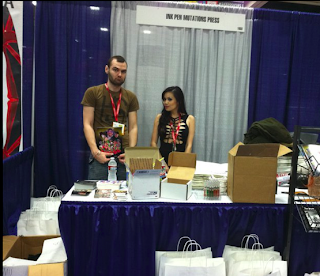 We had a blast at comic con this year, as we always do. This was the 5th year that Ink Pen Mutations Press had a booth at San Diego Comic Con and we did not want to disappoint. 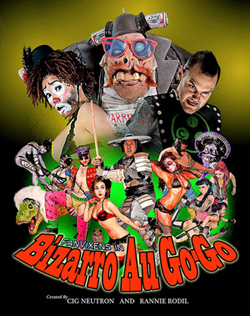 We had crazier costumes, lots of fun swag bags, and FanVixens in: Bizarro Au Go-Go made it's public debut. It was a lot of work, but so much fun. We are all still recuperating, but here are some photos of Bizarro Au Go-Go and the Ink Pen Mutations crew rabble rousing at the San Diego Comic Con. Cig and Ms. Rodil finally arrive at SDCC! Making swag bags for Ink Pen Mutations Press. Don't forget to joint their crazy mustache contest! 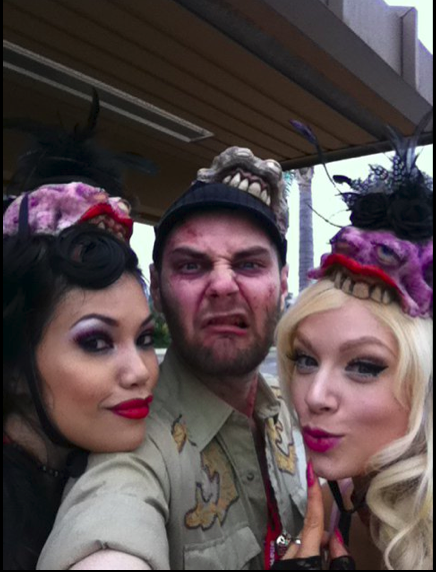 Rannie Rodil, Cig Neutron, and Laya Bella infested with bingebugs while waiting at the trolley station. Dear god, they are ugly...but festive. Order yours at cigneutron.com! Laya Bella and Rannie Rodil pose for Fox's Babes of Comic Con. Bizarro Au Go-Go FanVixens pose with the amazing Rafael. Best Friends and Bizarro Au Go-Go FanVixens Laya Bella and Ms. Rodil take a break. Being interviewed with the Bud Mizer. "What the hell is he?" The crowd ponders. He's a Crapulon from the planet Mullock. Here to steal our booze and bologna. Photo op with the very cool, Brett. I was on the same Trolley as you that morning. It was the perfect start to my 2011 Comic Con experience. Thanks.